I was PLANNING to clean out another flower planter yesterday. My husband came in and told me we had a problem with the greenhouse. The end ‘wall’ you’re looking at in this photo had broken loose because the last pvc pipe ‘rib’ closest to the lumber had broken. The rib isn’t repairable. We would have to take the whole end of the greenhouse apart and replace the whole rib, probably resulting in more damage. My husband, who is really good at figuring out how to fix things, figured out that we could attach heavy wire (like that used in the guy wires for the ham radio tower) to the upright pieces of wood on either side of the louvered exhaust fan. He is outside as I type (waiting for an important phone call we’re expecting) drilling a hole some distance away from the end of the greenhouse. He’ll then pound in a metal stake with the sledge hammer. Then we’ll attach the wires with what I think are called turnbolts – metal things with rings on each end and a threaded length in between that you can turn to tighten the wire until it’s taught. 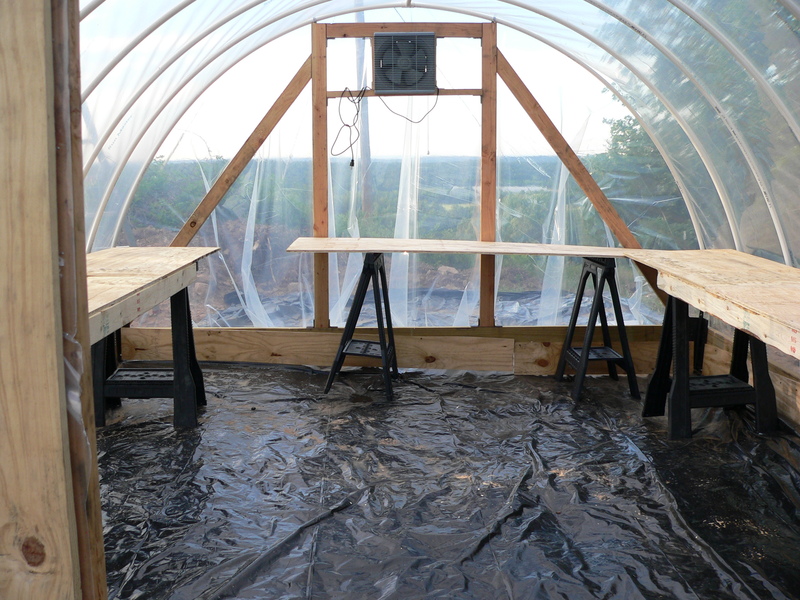 The stake and ‘guy wire’ type attachment should keep the end of the greenhouse secure. I’m not sure what he’s planning about the broken pvc pipe. Maybe we can just ignore it and rewrap the transparent liner stuff on the end carefully. If I can get the yard under control for the winter, I’m planning to start moving things around in the greenhouse, getting ready for planting seeds later. I’ll post pics as I get things organized in there. Arkansas doesn’t do a great job of winter. 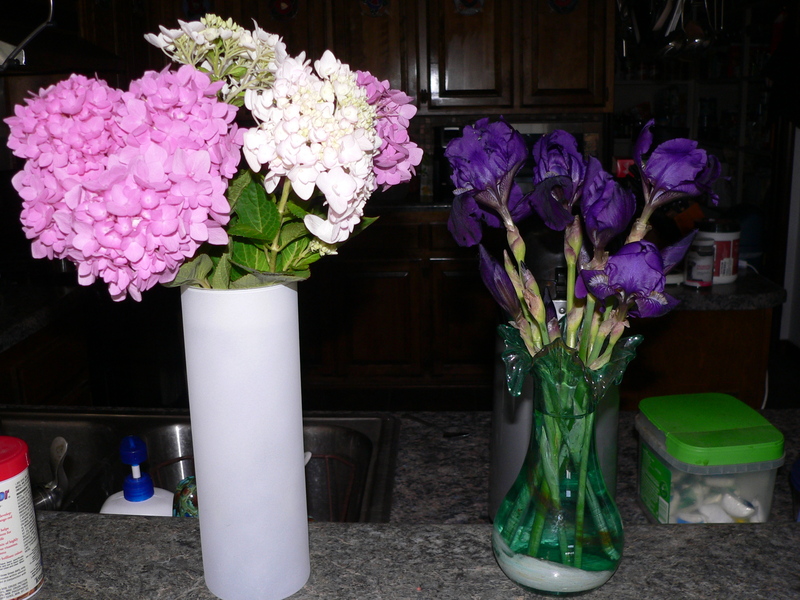 Since my flowers will probably be gone by the end of the weekend, the first thing I did today was cut some of the twice-blooming purple iris and some of the hydrangea blooms, bringing them in so we can enjoy them for a few more days. I then went out to the garden. I had stored old sheets and clothespins in a tall trash can that just fit under one of the raised bed planters. It occurred to me last night that ‘something’ could have gotten into the trash can, since it doesn’t have a lid, and that I might not want to encounter whatever it was. This morning I brought the trashcan out from under the planter box, dragged it out of the garden and dumped it on its side quickly on the ground. Nothing showed up, so I grabbed the bottom of the trash can and shook out the rest of the contents, throwing it on the ground again, staying well away. I lucked out. No critters, No snakes. No insects or nests – just sheets and a bag of clothespins. I’ll put the sheets out tomorrow night and Saturday night, and then put them back in the trashcan, but I’ll move the can into the shop for safekeeping this time. I found four tall stakes that I can put in the planter that holds the purple plant and the elephant ear plant. I put a sheet and some clothespins in the planter, ready to cover the plants tomorrow night. I dug up the two youngest tomato plants after finding two large pots. I replanted them in the pots with Mel’s Mix and left them on a table in the greenhouse. *NOTE – Don’t EVER use the cheap plastic PVC pipe holders for ANYTHING. Always get the metal ones. I then spent about 20 minutes securing the sheeting that is stretched over the ribs where it was coming loose. Since we’re having gusty winds, about 30mph this afternoon, this will be a good test of the greenhouse. Fingers crossed. I think I told you that I finally got the book on starting my greenhouse. 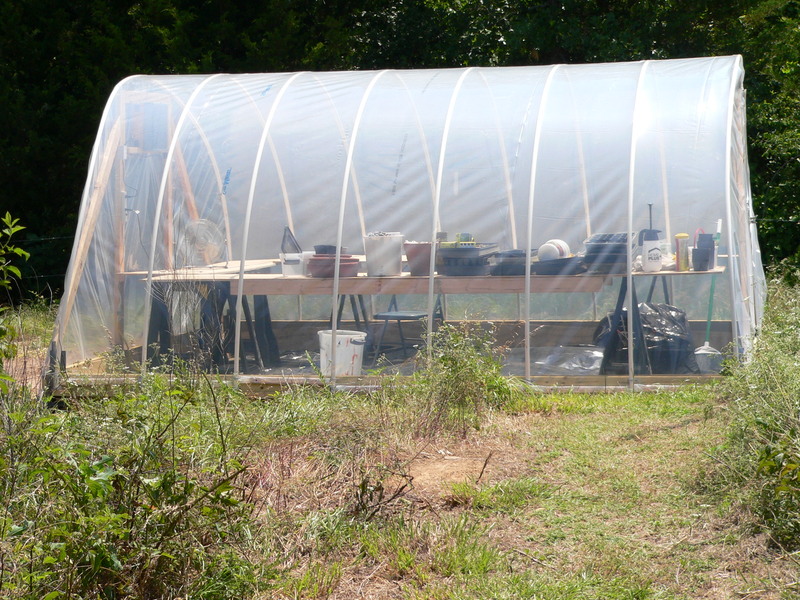 It’s called Gardening in Your Greenhouse – Greenhouse Basics, by Mark Freeman. I’m learning a TON. This was just the book I needed. I particularly love the sections about starting seeds. He does it a completely different way than I have, using the same seed starter stuff I’ve been using. Since my nickname is the “Serial Seed Killer” I need all the help I can get! I’m making a list of things I want to get to use out there, plus I’m getting ideas on how to make the best use of my space, and a realistic idea of what I can do – plus my limitations – so I have a better idea of what to expect. As I try to implement some of Mark’s good suggestions, I’ll try to share them with you. I still have a to-do list as long as my arm of things I’d like to do outside, but I really don’t like trying to gather leaves for mulch in a gusty wind. Except for the actual covering of what I can cover tomorrow night, we’re pretty well as ready for the freezes as we can be. We’ll regroup after and see where we are. I’m going in to put my feet up and read more of my greenhouse book. I hope you’re having a wonderful day.